In any diagram, right click on the Selector from the diagram toolbar and then select Configure Buttons… from the popup menu. In the Configure Buttons window, expand the node(s) of model element type(s) that you want to add shortcut for. Select the stereotype that you need to apply to that type of model element in future. Click > or double click on it to assign. Click OK to confirm. 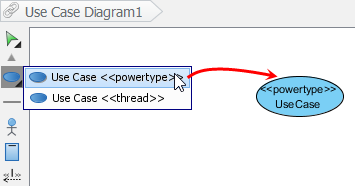 After all, you can find the shortcuts in diagram toolbar, under the selected type(s) of model elements. By selecting a stereotyped model element type and click on diagram, you can create a shape with stereotype applied.